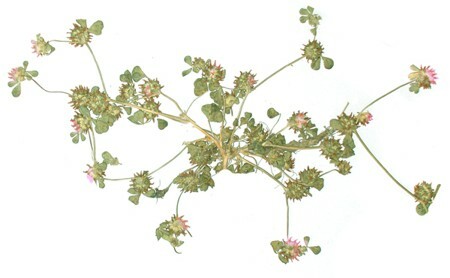 Amoria glomerata (L.) Sojak, Micrantheum glomeratum (L.) C.Presl, Trifolium axillare Phil., Trifolium duodecimnerve Willk. & Lange. Annual herbaceous plant. Stems 5-30 cm tall, branched, angular, glabrous. Stipules scarious, lanceolate. Leaflets obovate, small. Inflorescences sessile, axillary heads, globose, about 1 cm long, shorter than adjacent leaves, dense, with condensed sessile flowers in axils of lanceolate, pale bracts. Flowers 6-8 mm long, calyx 4-5 mm long, broad, glabrous, with sharply prominent 10 pibs. Corolla pink. Fruit a scarious 1-2 seeded pod. Flowers in April, fruits in May. Autogamous plant. Occurs in lowland. Wet sites in seaside zone.